From a humble beginning in mid-1942, VMF-214 became the most famous U.S. fighter squadron of World War II. The pilotsâ€™ reputation grew as they transitioned from flying Wildcats to the iconic gull-winged Corsairs and became the Swashbucklers, going head-to-head with the skilled pilots of the Imperial Japanese Navy during the early days of the Solomon Islands campaign. The squadronâ€™s fame really took off when Maj. Gregory Boyington, a hard-drinking former Flying Tiger, formed an all-new unit from a group of hand-picked pilots. They chose a new nickname: the Black Sheep. During two combat tours spanning eighty-four days, the Black Sheep established a blistering record against the tenacious Japaneseâ€”first in the skies over the fabled islands of New Georgia and Bougainville, and later over the stronghold of Rabaul, New Britain. Tangling in dogfights that sometimes involved as many as two hundred planes, the Black Sheep were officially credited with ninety-seven aerial victories and another thirty-five enemy planes probably destroyed. No fewer than nine Black Sheep became aces, including Greg Boyington, who earned a Medal of Honor on his way to becoming the Marine Corpsâ€™ top gun. 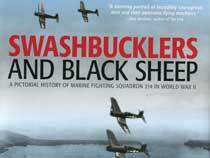 Black Sheep expert Bruce Gamble draws on years of research and personal interviews with VMF-214 veterans for Swashbucklers and Black Sheep, as well as wartime diaries, reports, and photographs, including rare color shots of the squadron. Dramatic paintings, some specially commissioned for this book, capture the squadron in action in the air and their camaraderie on the ground. Swashbucklers and Black Sheep also provides an overview of the squadronâ€™s postâ€“World War II service, from Korea to Vietnam to numerous deployments in the Middle East, making this the definitive illustrated history of the squadron. 216 pages, HB w/dust jacket, B&W and colored Photos, 10 x 11in.